Not that long ago, they used to do electroshock to try to change gay people and make them straight. Heck, even when I came out in my twenties, the first thing my parents thought of was getting me to a therapist to "fix" me. And in fact, all the legitimate research shows that the only way people are able to "change" is if they fake it. Even the ex-gay ministries admit the gay feelings never go away. (And there are some famous stories of ex-gay leaders who fell in love with each other - in gay love, that is!) There's a lot of hate out there, and a lot of self-hate. But we shouldn't let so-called "medical" and "mental-health professionals" continue to torture kids who just want to be themselves. 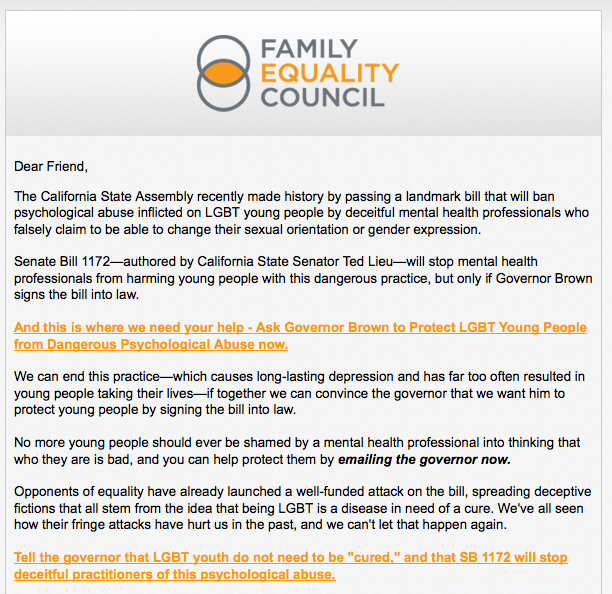 The California State Assembly recently made history by passing a landmark bill that will ban psychological abuse inflicted on LGBT young people by deceitful mental health professionals who falsely claim to be able to change their sexual orientation or gender expression. Senate Bill 1172—authored by California State Senator Ted Lieu—will stop mental health professionals from harming young people with this dangerous practice, but only if Governor Brown signs the bill into law. 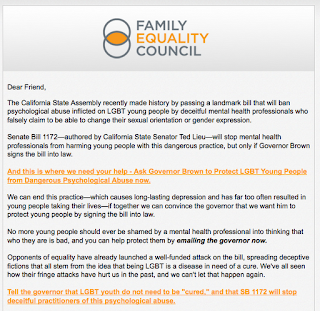 Family Equality Council has organized an campaign to send emails to California Governor Jerry Brown - and you can add your voice! Let's make it clear that it is unethical and wrong to try to change who people authentically are - and that trying to change those young people should have consequences!